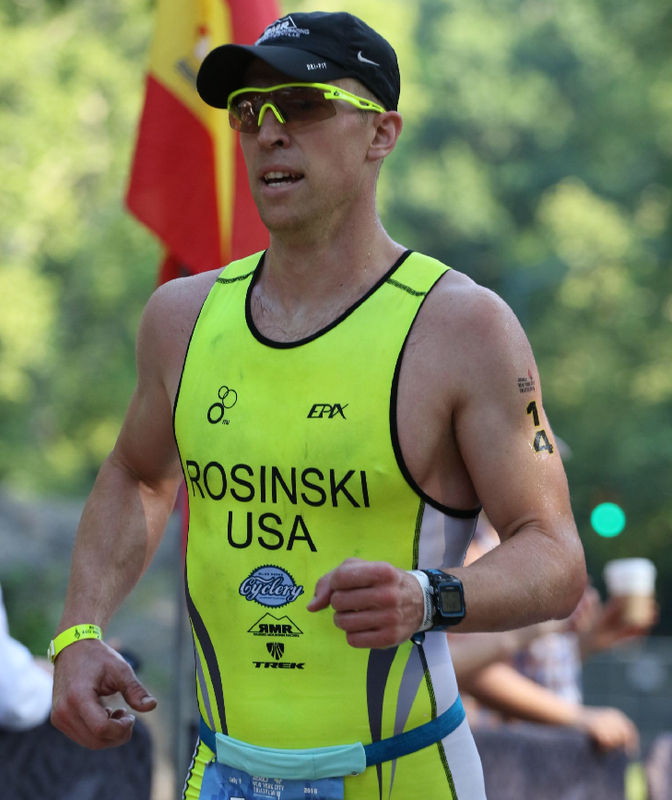 Welcome back pro triathlete Steve Rosinski from Charlottesville, VA, to the Luray Triathlon! See our interview with Steve below. Not only am I an Optometrist and an avid triathlete but I am also a husband and a father. I grew up a baseball player but turned fulltime runner in college as I ran Cross Country and Track for Lehigh University. While getting my Doctorate I had become burned out on running so I started swimming and biking for some new challenges. Within the year I started my first triathlon and have not looked back since. After graduating with my Optometry degree, I started to really focus on triathlon and see where it could take me. Within a year of graduating, I earned my USAT Elite License and that was 7 years ago now! Crazy how time flies! Have you raced Luray Triathlon before? I raced the Hawksbill Double back in 2014.I was supposed to race in Luray in 2016 but my son was born race week that year! What’s your best finish at Luray? I was 3rd in the Olympic in 2014 and 2nd in the Sprint. What brings you back to Luray? Luray is an amazingly, beautiful area that is close to where I live. I also love the idea of pushing yourself on two consecutive days on a tough course with plenty of hills! Triathlon is my outlet amongst the busy days- I need it to keep me sane! With having competed in endurance activities for more than half my life it helps me with balance and I get grumpy if I don’t get my workout in. And if I am going to train, I might as well race! I am a competitor and by racing it keeps my workouts focused a goal. How has your lifestyle changed since you did your first triathlon? Life has gotten crazy!! Instead of only school to worry about I now have a wife, a son, a job, a house to care for and I wouldn’t have it any other way! The balance of life makes for a fun adventure. Which races are you doing at the Luray Triathlon (Sprint Tri, International Tri, or Both – Hawksbill Double)?? What are your goals for the Luray Triathlon? I would love to win every race I compete in but that is just not realistic. With multiple time champion Adam Otstot coming back it will be a tough task but I will do my best! What advice would you give to any aspiring triathletes? Enjoy the journey! Like life, there will be ups and downs but make sure you are having fun doing it. It is a great sport with a huge community. Whether you are the fastest or the slowest there is a place for you in triathlon. If swimming, biking, and running interests you then give triathlons a TRI! What’s next for you for triathlon? The Luray Triathlon!! After that, I will be competing in the Nations Tri in DC. I am sure I will find other races to hop in as well!